An angry owner, bitter Clevelanders, jubilant Floridians, and even Jesse Jackson! No matter which way you slice it, there's been a lot of hullaballoo about Lebron James' recent decision (announced in an hour long ESPN special) to move to the Miami Heat. In many respects, the coverage has been exhaustive. Yet, in the midst of the media circus, there is one aspect of James' announcement that hasn't received much attention: the fact that the lead sponsor of the ESPN special was the University of Phoenix. The eight brands in the broadcast got nearly $3 million worth of exposure, according to media research firm Joyce Julius & Associates. (We can safely assume that's a whole lot more than they paid.) Top of the list was the University of Phoenix, with its banners, on-screen graphics and logos appearing for a total of two minutes and 22 seconds, and earning 11 verbal references, for more than $1 million in value. Lebron James and the University of Phoenix clearly viewed this partnership as a win-win situation, and it is easy to see why. Lebron gets to appear as though he cares about education, while Phoenix manages to burnish its brand image by appearing to be charitable. Furthermore, the donation of scholarships makes Phoenix look more like a traditional university--one can now win a scholarship to University of Phoenix, just as one might win one to NYU. The aura of legitimacy, of course, is precisely what this for-profit corporation craves. 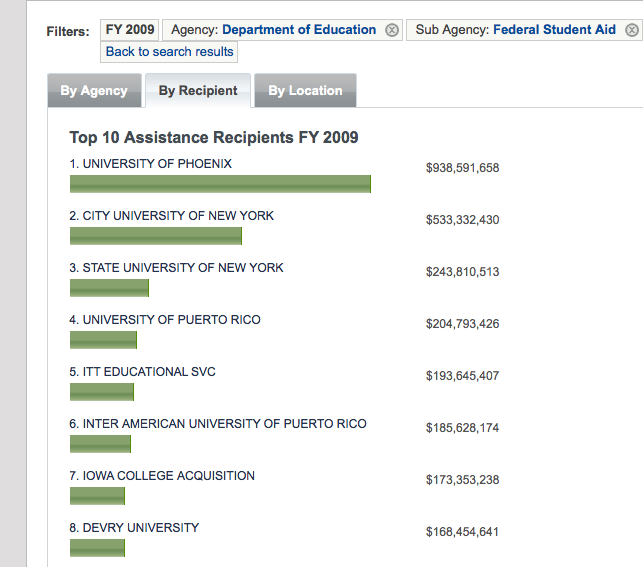 The full list of aid recipients is here--you'll note that University of Phoenix hoovers up an incredible 4% of all federal student aid. 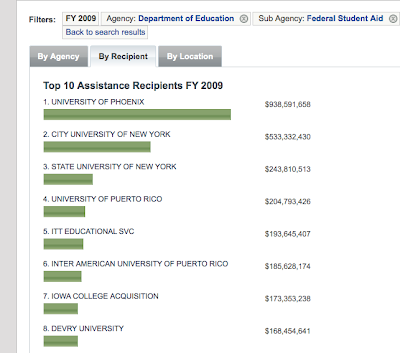 The growth of this for-profit institution highlights the key question: do students get a solid education at the University of Phoenix? It's difficult to say. Certainly, a recent whistleblower lawsuit about a cash for enrollments scheme raises some serious doubts about practices at the institution. I think there's a strong argument to be made that a lot of Phoenix students would be better served at public institutions like state universities and community colleges. Yet the fact remains that somehow, Phoenix is managing to persuade a significant number of students to pay for its offerings. This is a trend that should worry those of us who work at more traditional institutions.